The shrimp season in New Hampshire was very short this past winter. I was fortunate to purchase a bucket of shrimp from our local fisherman, Mike Anderson of F/V Rimrack. I cleaned the shrimp, saved some of them in small bags and kept them in my freezer. This evening I decided to make this dish with spaetzle. Despite the shrimp having been frozen for months they tasted extremely fresh. I had a lot of scallion from my garden so I decided to use it in this dish. I served it with steamed tender string beans and chilled white wine. Earlier this week I was watching my young niece and nephew while my brother and sister-in-law worked. I made spaetzle and added sauteed diced onion, ground chicken, and tomato sauce. They all seemed to enjoy them including the little ones. Here is another dish but with shrimp. 1) In a medium bowl whisk all the dry ingredients (flour and salt) with 1/2 C water. 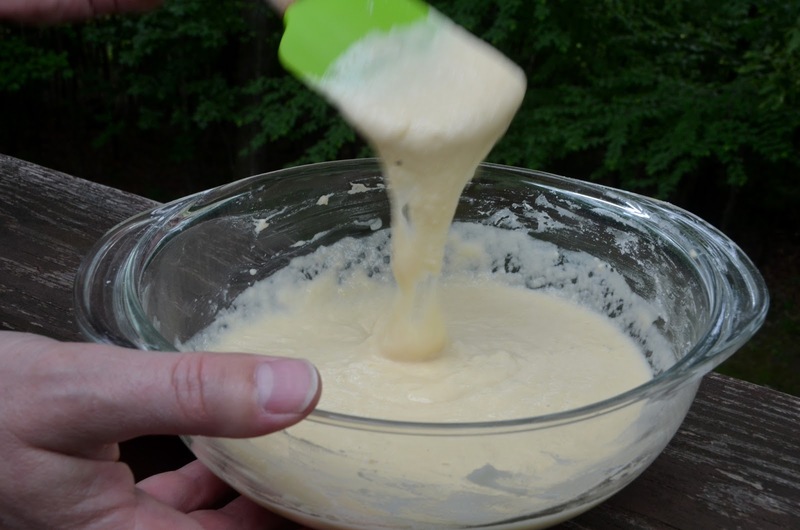 2) Add egg and mix well until all ingredients are blended. 3) Let the mixture rest for 5-10 minutes. 4) In the meantime heat a large pot with 5 C water (may add a pinch of salt if desire) over high heat until the water boils. 5) Turns heat to medium and use a large pan or colander with large holes (about 1 cm or 3/8-inch in diameter) to place on top of the pot. 6) Take a small amount of dough and force through the holes. 7) When the dumplings float to the top, scoop them out to a clean bowl. 8) Continue this process until all the dough is gone. *Previously in this blog I made my turmeric spatzle using one egg. I had two eggs left in my refrigerator and decided to add both in this batch. The result makes the spaetzle more tender. Both are equally tasty. *You may want to use a smaller hole pan or colander since the batter is thinner. thank you Paul (the husband) for helping me! 1) Heat a medium size pan with 2 Tbsp of oil over medium high heat. Once the pan is hot add scallion and garlic, saute for about 1-2 minutes. 2) Add the shrimp, stir occasionally about 3 minutes or until the shrimp is just cooked. 3) Add fish sauce, sugar and black pepper. Saute for about 1 minute. 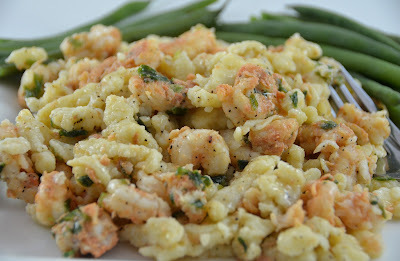 4) Stir in the spaetzle and 1 Tbsp of oil, saute for about 1-2 minutes and remove from heat.